Click here for our district and campus calendars. On Tuesday, March 26 students from Brenham Junior High School and Brenham High School attended a special student leadership event at The Bush School of Government & Public Service at Texas A&M University. 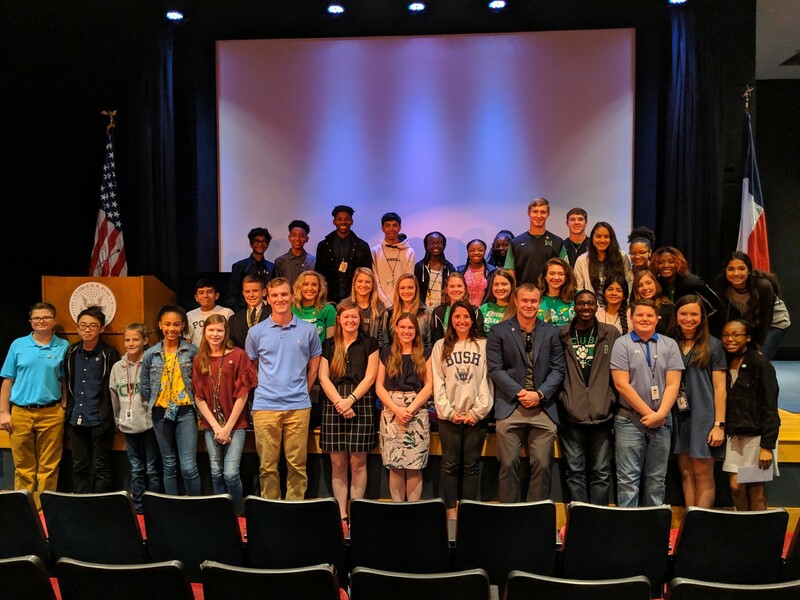 These students are part of the superintendent’s student advisory council for the 2018-2019 school year. The visit included a tour of the George H.W. Bush Presidential Library, conversations with graduate students about college life and leadership, and a tour of The Bush School of Government & Public Service. 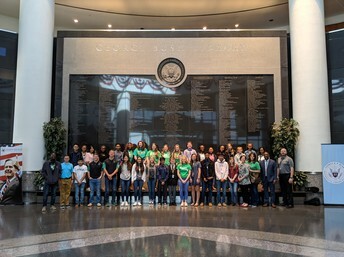 Many thanks to The Bush School of Government & Public Service for this opportunity, and a special thanks to graduate assistant for the Office of Admissions and Recruiting Tiffany Easter for coordinating the event. 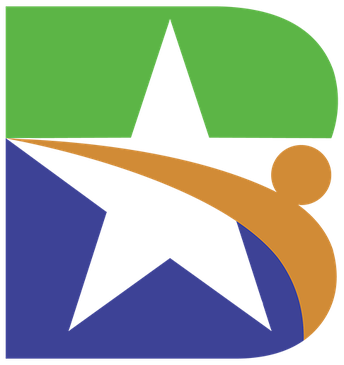 Do you have a student entering BISD in the fall? Click here for 2019-2020 new student registration information. The Brenham Cubs athletic department is extending their leadership from the field into classrooms with the Brenham Readers and Greeters program. 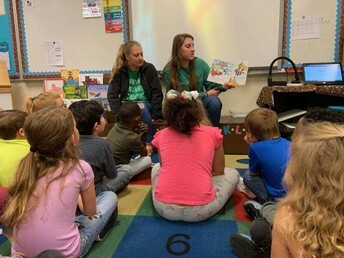 This program gives student-athletes from Brenham High School an opportunity to be visible on elementary campuses, assisting with morning car duty and filtering into classrooms to read to lower grade students. The big idea is to ignite enthusiasm and motivate younger students while providing character development and leadership opportunities for student-athletes. The program was recently implemented at Alton Elementary School, Brenham Elementary School, Krause Elementary School, and Brenham Middle School. Student-athletes are deployed to campuses at 7:15 a.m. Monday through Thursday to greet students and help in the morning car line. 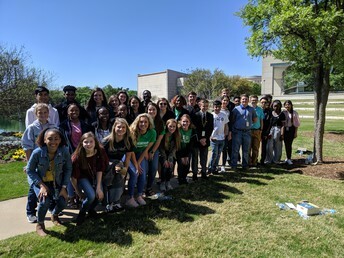 Other groups travel to the campuses during athletic periods to work with students for 25-30 minutes throughout the day based on a schedule developed with input from campus administration. Good luck to all BISD students taking STAAR/EOC tests! Click here for testing calendars from the Texas Education Agency. 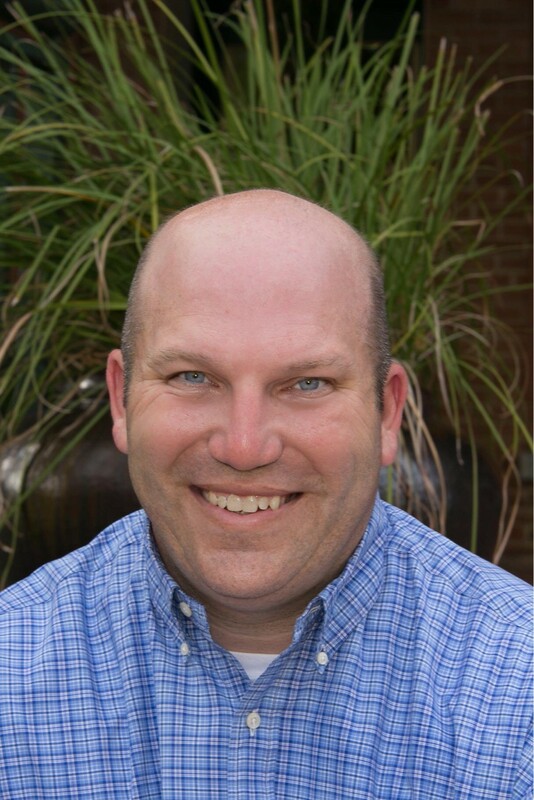 Brenham High School Career & Technical Education teacher Chris Kenjura has been selected by the Career & Technical Association of Texas (CTAT) awards committee as the CTE Teacher of the Year for 2019. Kenjura and fellow award recipients from CTAT, TIVA and THOA will be interviewed by a state committee to determine who will move forward to ACTE Region IV 2020. 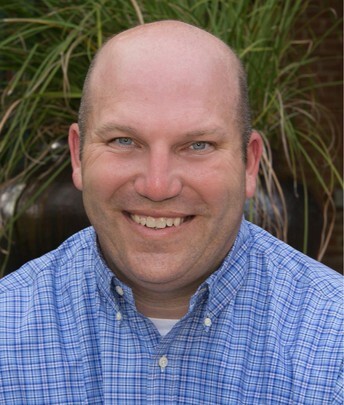 Kenjura will be honored at CTAT's annual awards luncheon scheduled for July 18 at Hyatt Regency Houston. 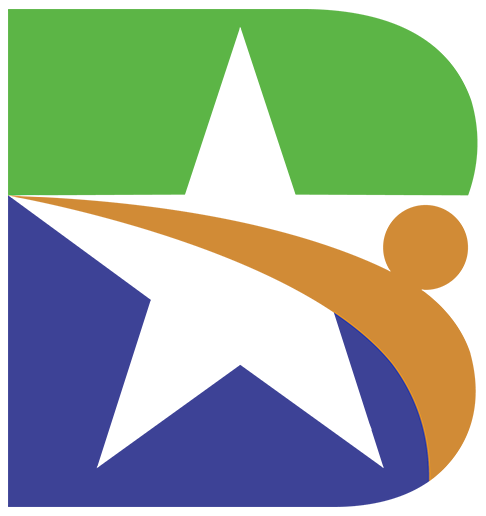 Click to see Brenham Community Ed's latest courses! There's something for everyone and new courses being added daily! Fitness, arts & crafts, health & wellness and summer youth enrichment camps coming soon! 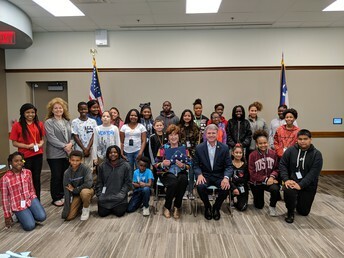 On Wednesday, March 20, fifth and sixth-grade students from Sue Anderson's life skills class at Brenham Middle School met a very special guest at the Nancy Carol Roberts Memorial Library. 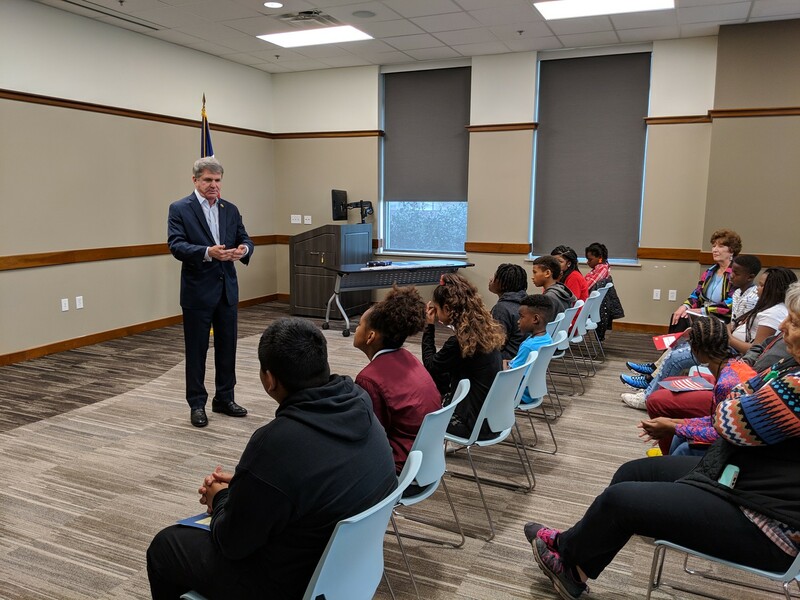 Congressman Michael McCaul spoke with the students about service and leadership. Each student had a speaking part in the event including a welcome, an introduction, sharing of major accomplishments, and a question and answer section. 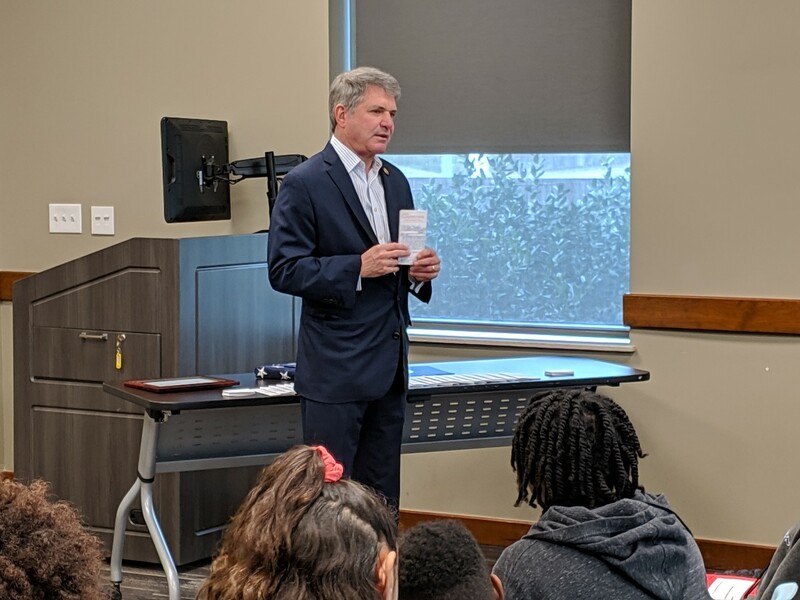 The students learned that McCaul has a home in Austin and in Washington D.C., that he is an Astros fan, and that the hardest part of his job is being away from his family. McCaul told students to always believe in themselves and ignore the critics. "I am proud to be here and I am proud of you," he told them. 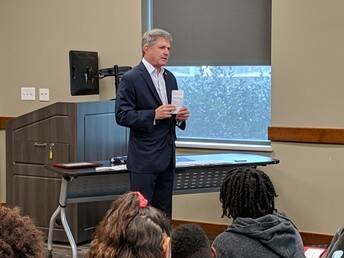 McCaul provided a pocket-sized United States Constitution to each student and presented Sue Anderson with a flag that flew over the United States Capitol. Click here to see why we choose Brenham! 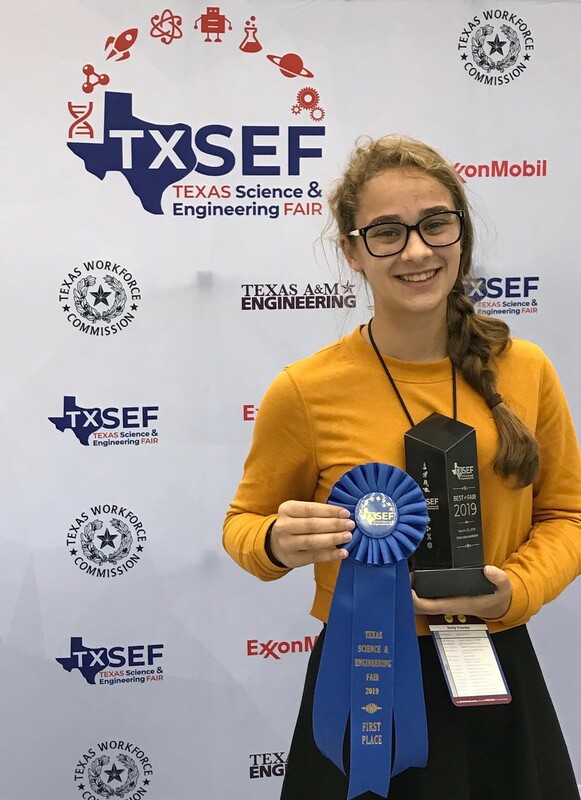 Brenham High School ninth-grader Emily Crawley placed first in Plant Sciences in the Senior Division at the Texas State Science Fair on March 30 in College Station. Emily was also awarded one of eight Best of Fair awards which earned her an invitation to the INTEL International Science Fair in Phoenix, AZ in May. She will join approximately 1,800 high school students from more than 75 countries, regions, and territories for an opportunity to showcase her independent research and compete for monetary prizes. Emily's project is the result of three years of work. She began the project in seventh grade and has earned an invitation to the state science fair all three years. The title of her project is Space Botanist: Effects of Fertilizer on Tomatoes Grown Upside Down in 75% Regolith. 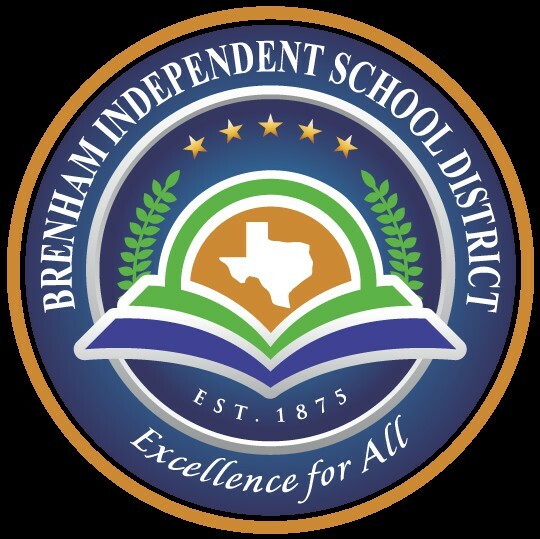 Brenham ISD is hiring! Click here to apply! Brenham FFA member and chapter Secretary Caeden Scherer had an excellent week at the Houston Livestock Show. Caeden exhibited his beefmaster heifer where he placed first in his class and was selected as Senior Calf Champion. He then competed for breed champion where his heifer was selected as Grand Champion Beefmaster Heifer. 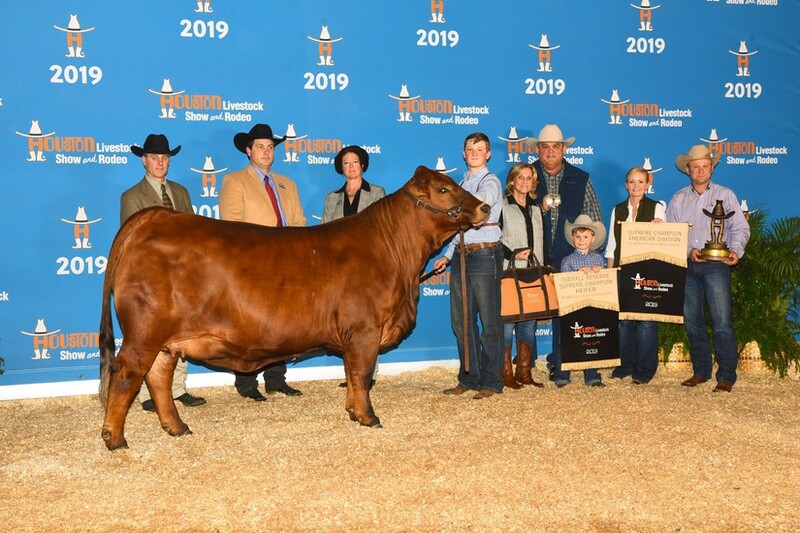 Furthermore, Caeden had the opportunity to compete against all of the other breed champions that were selected over the duration of the Houston junior heifer show. He and his heifer were chosen as the Reserve Champion Overall Supreme Heifer, the second highest title of the entire junior heifer show. This win follows his Reserve Champion Beefmaster Heifer win in San Antonio and first place class winner in Fort Worth.